The internet connectivity has changed the world forever. Products, services, and information are available on the fingertips of everyone. Significantly, when it is about any products, customers are capable enough to create or design anything as they don’t prefer to wear old shoes available at traditional stores or shopping malls where everyone goes. So, if you owe an online eCommerce store, offering shoes online, it would be a good choice to offer shoe personalization with the help of shoe design software. Numerous companies and brands like Nike, Adidas, etc. are offering shoe customization. But not all are having full-fledged features, giving you a chance to take smart mover advantage and integrate feature-rich software with the website and approach the market where you can tap into. Offering shoe customization and enabling them to design the shoes of their desire, is the best option if you are the owner of shoe manufacturing and selling concern and also offer shoes on digital platforms. Unique and creative: The shopping malls have numerous stores that sell the same kind of shoes that people buy from the stock. So, why can’t allow your customer with unique software which would enable them to create their shoes by own as per their need and want? Primarily, if anyone can develop their shoes by own, they will go to purchase it as it is designed by them and is as per their needs and requirement. Moreover, this software allows your customer to stand tall in the crowd rather than purchasing the old shoes available in the stock that everyone can buy. If you are looking forward to enabling your clients with the ability to design the shoes as per their desire and likings, then it will be best to integrate shoe designing software on eCommerce store to offer customization. Trustworthy customer and enhanced awareness: Every business owner looks for trustworthy customers who come back to the website for more. By allowing the customer with the ability to develop their shoes by own, you will attract more of the customers. If you meet the expectations of the customers by allowing them to create what they love, it will help in ensuring you that the customers are loyal towards your brand. Moreover, customers will let your family/friends about personalized shoes they had purchased from eStore. This will attract more of a customer because of the referrals, awareness that you owe shoe design software on your shoe eStore and this will add to your bottom line. Offering those customization options that lead your customers to stand tall in the crowd and product they love, you will have increased customer base and goodwill in the market. Freedom from desktops: The world is highly interconnected, and the internet is available everywhere across the globe. It is accessed with numerous devices and gadgets like mobile phones, desktop, and laptops. So, if a customer is using such devices simultaneously, so give them the leverage they deserve and attract them by offering customization works with every device. Old online software used to work only with desktops as its compatibility is limited to that because of its development in a flash but this is not the case anymore. Select shoe design software that works seamlessly on all platforms and devices and is not limited only with desktops. This is called highly responsive Omni channel based shoe design software that is essential in this technology-driven era. 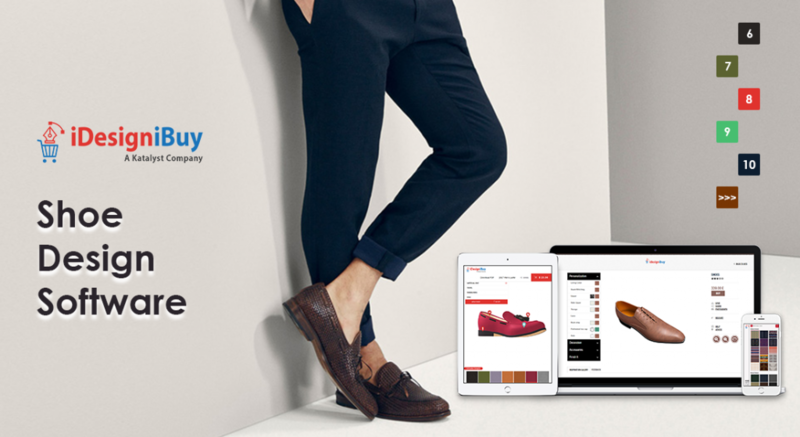 Nobody knows what device customers are using, so it is significant that shoe design software works seamlessly across the entire device before integrating it with eCommerce store for the customers. The more freedom and options one give to the end users, more customers will get attracted for customization. Easy and robust functions: Integrating shoe design software on your website is the best idea as one must have something very easy to use for end users. It is essential that software must be easy to operate and it is not significant to have technical knowhow, to operate it. It should be fast, smooth and easy to understand user interface for non-technical users. Moreover, shoe design software must have all the functionalities along with the personalization abilities. The ability to customize some of these textures, heel, shape, color, etc., the more options you avail to your customers, the better you are. Integrating footwear design software is one thing, but actual success for eCommerce store is to offer super easy software having all the features and functionalities of customization as per the expectations of the customers. It is significant to understand that you are offering a perfect blend of a user interface, robust functions, and latest features. Service support and deliveries: The factor is highly overlooked with the help of numerous business owners at the time of selecting shoe design software for the website. Support is important while selecting the company to work with specifically in the beginning as it will be time taking for you to understand the technology and its ability or limitations. So at the time of selecting a company for helping the one to deliver shoe design software as per the need and demand be assured that the company provides service support suitably. Analyze what the response time is, what are their warranties, and what features they are offering. The transparent your deliverables are about expectations of finished products; better will be for both the companies that are developing it and the customer who is receiving it. Unlike any relationship, transparency and conversation is the key. If you can ensure about the concise and clear goals efficiently along with the dealings while creating engagement with shoe design software, then it will be a smooth and transparent transaction. Integrating online shoe design software on your eStore is a decision that you won’t regret being a business owner, as long as you choose the right company to work on. Take the time and analyze properly while shoe designer software for your online eStore. The more careful you are with the decision, better will be your software. You must check, see and analyze as well as laid out when it comes to expectations, contracts and deliverables with a company you decided to go with so that it will not disappoint you later-on. If you get delivered the software as per your expectations and offer your customer who is unique and fresh, it will be the best business decision that a business owner will see in a short period of term. If you are looking forward to making the contract with a trustworthy, reliable, skillful and experienced company that can assist you in creating shoe design software as per the need and requirement of the business, iDesigniBuy will assist you in every possible way available. Our developers are highly skilled and experienced that they can deliver the software as per your expectations. For more info drop us a mail at info@idesignibuy.com. Previous Previous post: How to grow the business through custom apparel software?